Home » Researching Your Next Boat » Why Buy a Hunter? Hunter Marine began building sailboats in Florida in 1973. They immediately built a reputation of quality and solid value. The interior volume has always been outstanding and the ease of sail handling has also been a constant. They were one of the first manufacturers to not only offer a roller furling headsail, but roller furling main, as well. On most models all running rigging is led aft to the cockpit offering safe and easy sail handling. Quality components have always been part of every Hunter, including Lewmar winches and RayMarine electronics. For many years, Hunter was the only manufacturer to offer all your essential gear, including life jackets, dock lines, fenders, anchoring gear, flares, and even a copy of “Chapman’s” as part of its “Cruise Pack” which was included with every delivery at no extra cost. Other significant innovations worthy of note are the stainless steel cockpit arch and the B&R Rig. First let’s look at the B&R Rig which sweeps the spreaders aft and eliminates the boat’s backstay by securing the mast at three points, 120 degrees apart, rather than the traditional four points at 90 degrees each. The theory, which has been proven true, is that a stool with 3 legs is more secure than one with four legs. The benefit is three fold. First, stronger support for the mast than traditional rig designs. Second, with no back stay, you can increase the sail area of the main with a larger roach. Third, no back stay means easier access to the walk thru transom. The earliest versions of the B&R Rig were successfully sailed around the world by sailor Steve Pettengill on “Hunter’s Child” and by Warren Luhrs on “Thursday’s Child.” Despite the incredible success of the B&R Rig, it does have its detractors, some of which raise potentially valid concerns. For those desiring long-range sailing with SSB communications, the antenna is normally mounted on an insulated backstay. Without a backstay, installation of such an antennae is significantly more difficult, but not impossible. Another concern often raised is that the reversed diagonal spreaders necessary to support the rig adds additional weight aloft which may cause a boat to appear more tender, especially in a significant cross swell. Also, if one has in-mast roller furling for the mainsail, a great deal of the benefit of the rig design is lost as you can no longer have a fully battened, full roach main as is will not roll up in the mast. This can be remedied by selecting in boom roller furling but this has additional costs. At its peak in the mid 2000’s, Hunter is said to have been producing over 2000 new boats per year. Unfortunately, the economic downturn of 2008 and beyond caused Hunter Marine to close its doors briefly, however, they were acquired by high end power yacht manufacturer Marlow Marine and are now known as Marlow Hunter. So far, it appears that Marlow Hunter is committed to continuing the Hunter tradition of quality, innovation, and affordability. 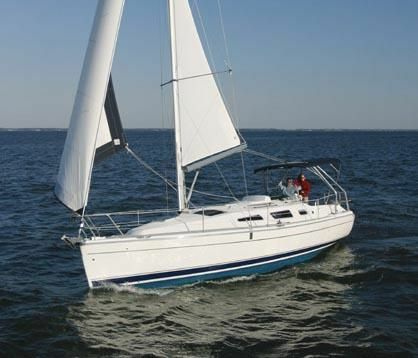 We at California Yacht Company have long been involved with Hunter sailboats. Our owner and manager, Steve Curran has previously been a Hunter dealer for many years. He and his wife lived aboard one of the early Hunter 450 models which is still considered by many to be one the premier live aboard sailboat designs. During most of those years, John Carello of our Long Beach location, was one of their top salesman. I also worked with Steve during some of that time and have owned 2 Hunters myself, a 1993 Hunter 33.5 and a 2003 Hunter 356. Drew Curran who works at both locations has more knowledge than most about all the various models over the years as he has sailed nearly all of them as a delivery skipper and doing commissioning. Over the years, we have sold many new and used Hunter sailboats to lots of satisfied sailors who have sailed them as far north as San Francisco Bay and as far south as Puerto Vallarta. Steve Curran raced on a customer’s 336 model across the Gulf of Mexico from Tampa Bay to Isla Mujeres, Mexico in 1997, 1998, and 1999. Steve recalls the weather in 1998 to be as bad as he’s ever seen in many years of sailing. Many larger cruising yachts either turned around or otherwise did not finish. They were 1st to finish in only a 33 foot boat! Overall, we have lots of confidence in Hunter sailboats developed over years of both sailing them and selling them to many happy customers. If you have questions about particular model, or just in general, we’ll do our best answer you. Please feel free to call upon us at any time.